I had a ‘Lunch and Interview’ date with Abimbola Dare, an inspiration fiction writer whose debut book “The small Print” came out last week. I received offers from a couple of magazines to write more short stories. And finally, I got an email from a publisher who told me that they were “quite pleased” with my latest finished book, ‘The Officer’s Bride’ and also wrote to say that they would consider it for publication in the future as soon as they start taking on new projects. I’ve cut and pasted the details of the email below. 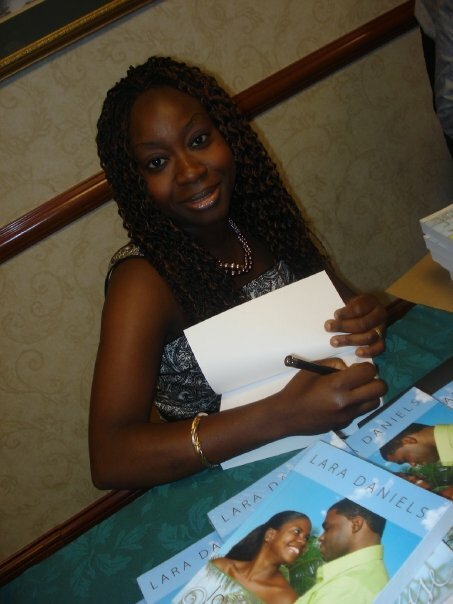 Lara, I am just finishing reading ‘For Wale Taylor – My first love’. I understand its fiction but there are tears in my eyes and have failed to battle some drops, they have coursed through my cheeks. My first reaction when I started reading Part 1 was excitement that I kept on muttering, ‘Thank God, I am reading a complete work and won’t be made to endure the burden of waiting for the next part as did others’ but reaching that sad, violent end I say nothing. I shed tears. You handled the story with a perfect resemblance of life, a brutal honesty in as far as reality is concerned Lara. You wrote what has to be. You gave me the twist I demand in art, literature. The story sounds real. Why? True love stories always have a sad ending while fictional ones have a happy ending. I hate the happy endings personally in fiction unless when masterly handled. You make me consider of trying my hands at romance writing Lara. Keep up the good job. That story, for the moment, is the very best I have read in romance online. You managed well the brutality of a murderer and the sympathy and compassion of a true human. As you can imagine, this encouraging note left me on such a high. It also brought along with it a sudden understanding of the path I needed to take in my writing career. I’ll surmise it this way: To write romance tales that deal with the hard questions that we ask in real life, yet working out the stories such that they leave you, my readers inspired with hope. I hope you join me in this wholly new exciting journey. If you’ve read any of my books or my stories posted here or on other sites, please send me your feedback as well. Until my next posting, I’ll say adieu for now.